Leveling concrete on industrial floors is a preparation method for adjusting the elevation of an existing concrete surface. 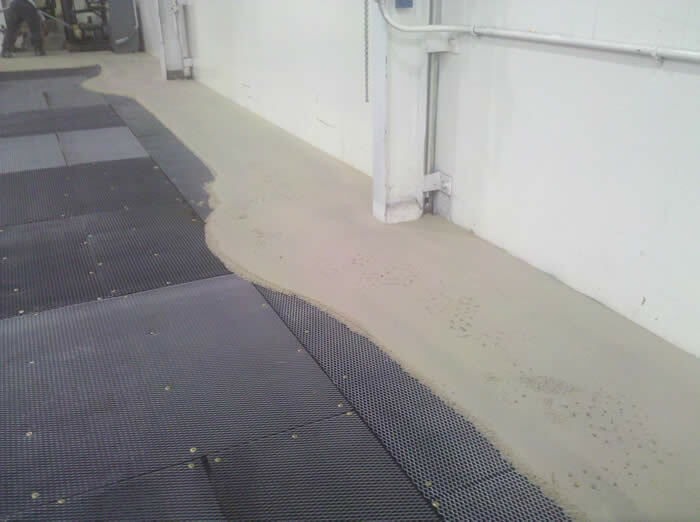 Industrial concrete floor preparation, leveling is often used when a production area that for its original purpose require drainage for various liquids is being renovated for a new or different use. The slope to drain of a production floor is pitched to direct liquids to various drains. When the area is utilized for other purposes such as office or pedestrian traffic, the slope can cause a major productivity and safety issue. Concare, your industrial concrete leveling floor contractor, can restore the concrete floor to a level condition. Our experienced and highly trained floor preparation and installation team can remove the current carpet, tile, or existing floor coating as well as any underlayment and fill the concrete industrial floor back to a flat or level surface. Contact Concare, an industrial concrete floor leveling specialist, to evaluate your existing sloped floor.